Why I Believe that the Mene-Tekel Bible Code is Genuine. 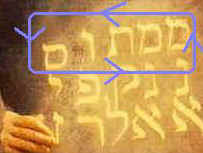 The above image is part of a more recent discovery within the Mene Tekel Peres Bible Code that was written upon the wall in Babylon (Dan. 5) in 2018/2019. It is advisable to read what is found on this site first before reading the more recent discoveries. Click here for this update. Also, see the sign of the eruption of Anak Krakatoa. and that if there are codes in the bible, this is the logical place to look. Moreover, some obvious inferences from those words "mene," "tekel," and "parsin"
why 3 'coins' (i.e., mene, tekel, peres), but no mention of 'coins' in Daniel's own interpretation? 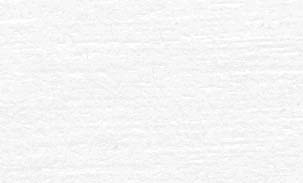 why was "mene" repeated twice on the wall, but interpreted as if written once? why is Persia implied in the word "Peres", but not specifically identified in Daniel's interpretation? and expands on the third thereby answering it too! How it is to be decoded! What the general reaction to the code would be! And specifically, the name and reaction of the one who discovered it! The bible code itself emphatically claims to be a divinely encrypted message, ("truly, truly"). In other words, the code speaks in the same style and manner as the actual surface text, when it records God's direct words. Each line of code forms an acrostic summarizing what its parent code says! This models the main acrostic, formed from the original words: "Mene, Mene, Tekel, Uparsin," which in Hebrew spells, "The-One-putting-him-to-death." Amazingly, this phrase capsules Daniel's own interpretation of these same four words! of the textual insertions that occurred up until around the time of Christ. the composite meaning of, "the banner of the cross!" "30 shekels of silver" (a divided-mina)---the very price of Jesus' betrayal! The context further implies, 'the breaking of the bread/manna of His body'! The code forms a picture of what it proclaims---and labels each picture accordingly! Each pictogram reads at the proper location that is suitable to what it is saying. For example, if the code speaks about being 'exalted to the right hand'---then it reads thusly at the right hand side of the matrix! There are other pictograms within the surrounding verses of Daniel 5:26-28 that agrees with, and enlarges upon, this mene-tekel code. 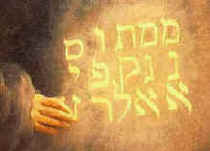 The bible code is a logical interpretation of the actual surface text in which it is embedded! It is not fanciful, but in accord with how the New Testament might also apply this text of Daniel 5 in the light of Christ, (Revelation 17-18). The interpretation is both an accurate and deep revelation about Jesus Christ, (Revelation 1:1), consistent with the rest of the bible. which again proves that at times God speaks in codes. Moreover, here, again, the theme is 'Babylon's fall'. The book of Daniel itself speaks about a sealed message (Daniel 8:26; 9:20-27), sealed numbers (Daniel 12), and a mysterious "Son of Man" who unseals them (7:10-14)---all of which the mene-code addresses specifically! The code uses the same Hebrew word for "concealed,"
as found in the above references, three times. "The One concealing the words of the scroll is also the One who put Belshazzar to death." I.e., the Babylonian empire (626 BC), + 1290 + 1335 years = AD 2000, etc. of the Twin Towers), there are seven years of years of the lunar calendar, (2539 years). This 'sealed message' was to be opened "at the time of the end," (Daniel 8:17, 26; 12:9-12), when "knowledge and travel will be increased," such as we have today, (Daniel 12:4). all this, 2500 years before the rise of communism! Public signs, such as the Twin-Tower tragedy. (1Cor. 12:10, cf., Isaiah 28:9-13). rather than obscurely, as in the case of the Twin Towers. only a prototype of that great battle of Armageddon to come. The code foretells the name, circumstances, and unbelief of him who discovered it---while at the same time also correctly applying to the historical (doubting) "Thomas" of the New Testament. The word "Thomas" means "Twin;" hence, it hints at another beside the first "Thomas." This is mentioned only for the sake of grasping the validity of the code. nor did he set out to find himself in the codes---it just happened to be there. two months after the release of this code. This would be coincidental, if it were not for the many other parallels. (Update: This article, including the above in red, was written several years ago. The mene-tekel code thematically ties-in with the other codes declared at this site. And these were found in other books of the Bible, yet by the same individual. How is it, then, that the same consistent theme of "the revealing of Jesus Christ" keeps popping up? These pictograms also numerically overlap one another into one composite message. Note that all the picture-bible-codes at this site are common biblical symbols for 'revelation'---and specifically for "a revelation of Jesus Christ," as depicted in the book of Revelation. Therefore, the bible codes, properly understood, are simply interpreting this Book, which, in turn, is simply interpreting the rest of Scripture. And the theme of the book of Revelation is stated clearly at its opening verse: "The revelation of Jesus Christ, which God gave him/Him to show His servants the things which must soon take place," (Revelation 1:1). What is the purpose of bible code pictograms? Also see, "What about AD 2012?" from Adam to Jesus are sequentially read.